In my last post I speculated about how we might adapt ourselves to the environments of other planets rather than trying to terraform them or forever be confined to enclosed settlements and space suits. I used Mars as an example of an “earthlike” planet we might consider colonizing. A Mars-type planet would be an easy challenge compared to others like Venus. The Venusian atmosphere is also mostly carbon dioxide but the air pressure at the surface is ninety times that of Earth, like being a thousand meters deep in the ocean. We know that fish and other creatures can exist at those depths, and some whales can dive even deeper for a time—so it’s not inconceivable that our bodies could be adapted for it (maybe even encouraged to grow a hard shell?) But again, we wouldn’t be breathing—air at that pressure is basically a fluid. We’d have to get oxygen and/or energy another way. And Venus is hot—hotter than Mercury—about 460 C at the surface. If there is any part that might be relatively hospitable to humans it would be the upper atmosphere, about fifty kilometers high, where the temperature and pressure are nearly Earth-normal. There are obstacles though: winds over 300 kilometers per hour and clouds full of sulphuric acid! OK, so maybe Venus-like worlds will be beyond biological adaptations and require either full space suits or at least extensive mechanical adaptations. Gas giant planets don’t hold much attraction as homes-away-from-home, but many of their moons might. With a tough enough skin and a metabolism that uses chemosynthesis instead of air-breathing, maybe we could survive in a near-vacuum, but it’s hard to imagine that we could ever adapt our bodies to temperatures that can freeze water as hard as granite. On Jupiter’s moon Europa, for example, the temperature at the equator (you know, the beach resort zone) averages about -160 C. Where there is a possibility of survival, however, is under the icy surface in an ocean of water. Someday we may create humans who can function as aquatic creatures, in which case our own planet’s oceans will provide a vast amount of space to explore and inhabit. There’s a chance that we’ll discover planets elsewhere that are almost identical to Earth and already support life. In that event, our problem will be that some of the life, particularly microorganisms, could be utterly hostile to humans. Deadly germs or bacteria. Then we’ll need to either adapt our immune systems to cope with the pathogens, or adapt our whole bodies to co-exist with the alien organisms (although, to be accurate, we’ll be the aliens). I haven’t even touched on the whole area of technological enhancements to the human body—turning us into partly-cybernetic organisms, or cyborgs. Maybe in another blog someday. And, of course, there are huge philosophical and ethical questions involved whenever the question of bio-engineered humans is raised. Is it too big a risk? If such genetic engineering had to occur at an early age or even at the fetal stage, could we make such decisions for our children? Most of all, how much can you change someone before they’re no longer human? We don’t mind the idea of fictional superheroes transformed by a radioactive spider bite or gamma radiation—the reality might evoke feelings that are quite different. For now, I’m content to leave this as an exercise of the imagination, but the time will come when we achieve the capability for such things. I hope we’ll have resolved our questions about it by then. COULD HUMANS BE ADAPTED TO OTHER PLANETS? In a recent post I mentioned that there are huge amounts of water elsewhere in the solar system—much more than actually exists on Earth. And when scientists assess the potential of other star systems to host life, the foremost yardstick they use is the presence of water, especially liquid water. Where there’s liquid water, there could be life that we would recognize. So a planet orbiting its sun in the so-called “Goldilocks zone” (not too hot, not too cold) might have liquid water and thus be capable of supporting life. Maybe. This fairly narrow view isn’t so much based on the idea that we only want to meet aliens that look like us (as in most Star Trek episodes) but more because we want to visit places that will present the fewest obstacles to our survival there. Lots of oxygen in the air would be nice. Clean drinking water. Reasonable weather. Gravity that doesn’t make us feel like we’re wearing lead overcoats. You’ve probably heard news stories about “earthlike” planets being discovered around other stars. That description usually only means that they’re rocky planets instead of gas giants, and they’re not frozen or roasting hot. That’s it. Everything else about them might be far different from Earth—we just don’t know because those planets are too far away. We do know about the planets in our own solar system, and by the above standards Mars would be considered earthlike, except a little cold. But we certainly can’t live there. At least, not yet. For humans to survive on another planet—in this solar system or any other—there are three ways to do it. The ways that get the most attention are: 1) building habitats (even domed cities) that will protect us from the planet’s hostile elements and enclose a simulated Earth environment; and 2) change the planet’s entire ecosphere into a close approximation of Earth’s—what is called terraforming. Enclosed habitats will always be very restrictive and costly to expand, while terraforming some place like Mars would take thousands of years. The third option is to change the human body itself in ways that will adapt us to the alien environment. On Mars that would require quite a few changes. We know that people can adapt to colder climates (especially over a number of generations) but even Mars’ most hospitable climes would require genetic tweaking to rev up our metabolism, increase blood flow, and grow much thicker layers of insulating fat under our skin. We’d have to grow a tougher skin, too, with closable orifices—even skin pores and tear ducts—to prevent the low air pressure from boiling away our bodily fluids. These things aren’t inconceivable as we get better and better at gene splicing—we’d find organisms with those traits here on Earth (perhaps creatures that live in extreme environments) and splice the necessary genes onto our own genome. Even so, a few more mechanical implants might also be in order, like heating coils in our nostrils to warm our inhaled air! Mars’ atmosphere is mostly carbon dioxide with very little oxygen, so to avoid the need to carry air with us we’d have to either re-engineer our body cells to use some energy source other than oxygen, or get assistance from something that can make the oxygen we need from CO2. Plant life uses photosynthesis to produce food energy from carbon dioxide and water using sunlight (but it’s slow). Creatures that live around deep-sea volcanic vents use chemosynthesis instead, getting their energy, not from sunlight, but from the oxidation of compounds like hydrogen sulphide gas. Giant tube worms, crabs, clams and others are filled with proteobacteria and archaea—some of the earliest life forms on the planet—which replace their usual digestive tracts of stomach, intestines etc. And we know many kinds of algae and bacteria that can produce oxygen from materials in their environment, including the bacteria Methylomirabilis oxyfera which extracts oxygen from nitrates in the river mud where it lives. Since our bodies already carry around hundreds of types of bacteria that help keep us alive, it’s not a huge stretch to believe that a few additional species might help us exist on other worlds. 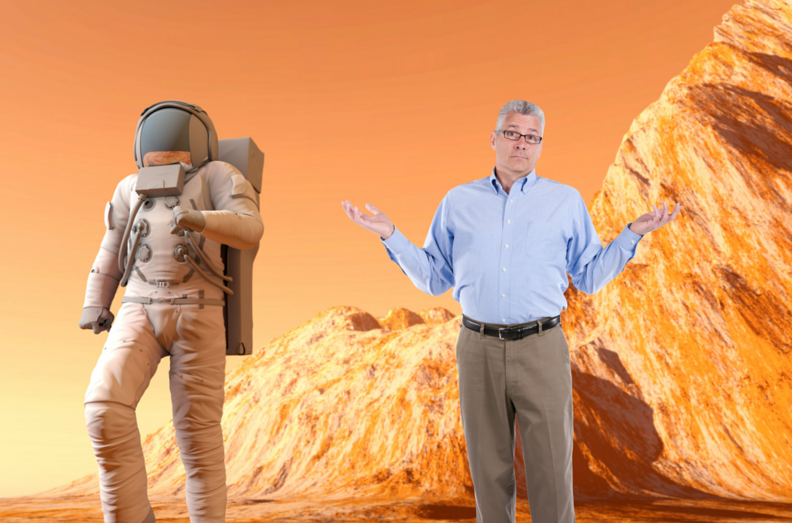 Mars would be one of the easier planets for us to adapt to. And, of course, there’s the whole ethical question of whether or not we should tinker with the human body to that extent at all. But that topic will have to wait until my next post. In the meantime you can read some other people’s thoughts about this here, here and here.